Targeting four institutions with structured science research programs for undergraduates, this study focuses on how underrepresented students experience science. Several key themes emerged from focus group discussions: learning to become research scientists, experiences with the culture of science, and views on racial and social stigma. Participants spoke of essential factors for becoming a scientist, but their experiences also raised complex issues about the role of race and social stigma in scientific training. Students experienced the collaborative and empowering culture of science, exhibited strong science identities and high self-efficacy, while developing directed career goals as a result of “doing science” in these programs. This study was made possible by the support of the National Institute of General Medical Sciences, NIH Grant Number 1 RO1 GMO71968-01. This independent research and the views expressed here do not indicate endorsement by the sponsor. American Association of Colleges & Universities. (2007). Making excellence inclusive. Retrieved June 2007 from www.aacu.org/inclusive_excellence/index.cfm. Augustine, N. R. (2005). Rising above the gathering storm: Energizing and employing America for a brighter economic future. Retrieved March 19, 2008 from http://www.commerce.senate.gov/pdf/augustine-031506.pdf. The College Board. (2005). 2005 College-bound seniors: Total group profile report. Retrieved February 25, 2008 from http://www.collegeboard.com/prod_downloads/about/news_info/cbsenior/yr2005/2005-college-bound-seniors.pdf. Epstein, D. (2006, July 26). So that’s why they’re leaving (Inside higher ed.) Retrieved February 2, 2007 from http://insidehighered.com/news/2006/07/26/scipipeline. Huang, G., Taddese, N., & Walter, E. (2000). Entry and persistence of women and minorities in college science and engineering education. Retrieved February 25, 2008 from http://nces.ed.gov/pubsearch/pubsinfo.asp?pubid=2000601. Mabrouk, P. A., & Peters, K. (2000). Student perspectives on undergraduate research (UR) experiences in chemistry and biology. Retrieved February 25, 2008 from http://www.chem.vt.edu/confchem/2000/a/mabrouk/mabrouk.htm. National Institutes of Health. (2007). 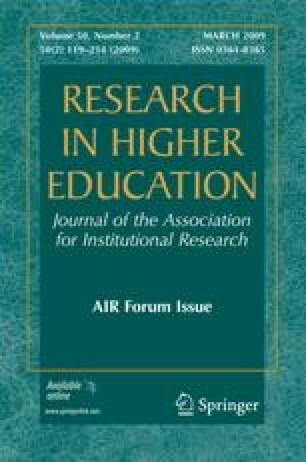 Research on interventions that promote research careers, RFA-GM-08-005. Retrieved August 2007, http://grants.nih.gov/grants/guide/rfa-files/RFA-GM-08-005.html.